MICHELE S. BYERS / NJ CONSERVATION FOUNDATION – Bald eagles are New Jersey’s early birds. In the chill of winter, they’re the first to build nests and lay eggs. Emile is constantly on the lookout for new nests to add to the state’s database. Recently, one of his family members spotted a bald eagle perched atop a church steeple in South Plainfield, and another flying in the same vicinity with an animal in its talons. “Having seen a pair of eagles, it’s likely that there’s a nest nearby, hidden in one of the flood plain forests near the Dismal Swamp, Cedar Brook or Bound Brook,” Emile said. 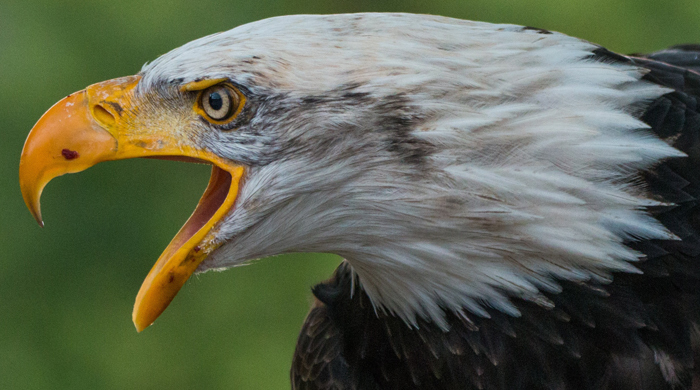 Want to see a bald eagle? Consider a trip to the Delaware Bay region, where eagles are frequently spotted as they hunt in the bay, rivers, lakes, marshes and reservoirs. Visit the eBird online map to see all the places where eagles have been seen recently. You can also check out the “eagle cam” focused on a nest at Duke Farms in Hillsborough. There have been recent signs of an eagle pair sprucing up the nest, but as of the first week in February no eggs have been laid. Read the 2018 report of the New Jersey Bald Eagle Project. Another fun way to learn about bald eagles is through “EagleTrax,” the Conserve Wildlife Foundation’s online mapping tool that tracks the movements of two eagles outfitted with telemetry harnesses. The first, “Harmony,” is a five-year-old female hatched at the Merrill Creek Reservoir and banded in 2012. The second, “Pedro,” is a four-year-old male who was rescued last year in Pedricktown after being found injured. To see where Harmony and Pedro have been pinged, go to conservewildlifenj.org/protecting/eagle-trax.